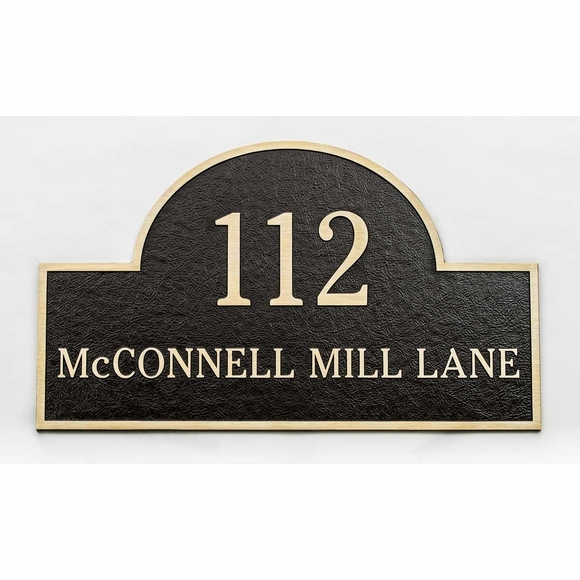 Custom Arch Address Plaque with House Number & Street Name - - traditional arch shape cast aluminum address sign with your house number and street name. 24" x 14". Made in USA. Address number line holds up to four (4) large 4.5" numbers. Street name line holds up to nineteen (19) smaller 1.375" characters. Cast aluminum construction with rich leatherette texture and clear-coat sealer. Color: dark oxide background with bronze-tone characters and solid border. Wall plaques include studs on the back for concealed mounting. Four holes are drilled and tapped in the back of the metal plaque to accommodate threaded studs for wall mount signs. Lawn mount signs include lawn stakes. Address shown on sample above: 112 McCONNELL MILL LANE.